Consultants of the shop typically answer questions during the day. We created a Personal Account for you to make the process of buying faster and easier in the future. Your message must contain at least 20 symbols. The message must not be more than 2000 symbols. 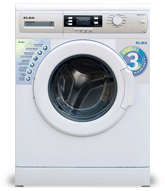 Unbelievable price on Elba Front Loading Washing Machine in Kuala Lumpur (Malaysia) company Fiamma, Sdn. Bhd..